Vegemite is a food product you either love or hate. There doesn't seem to be a middle ground with this dark-brown savory spread invented in Australia in 1922. Most Aussies love it, making it the most iconic of Australian foods. Vegemite is a thick paste used as a bread spread made from yeast extract flavored with celery, onion, and other ingredients. It's practically fat-free, sugar-free and vegetarian, but it is not gluten-free. Vegemite is an acquired taste and one that frankly defies description. If push comes to shove, it can best be described as having a salty taste with a subtle bitterness. The uninitiated should try it in small doses at first. Typically, it is lightly spread on toast or crackers with some butter. It also can be spread on toast with cheese slices or avocado or spread on toast to make Vegemite soldiers for Dippy Eggs and is sometimes used to flavor soup stocks. And then there are those who just like to eat it by the spoonful directly from the jar. While many New Zealanders like Vegemite, they tend to prefer Marmite which is similar in taste but slightly sweeter. Dr. Cyril Callister, a chemist employed by the Fred Walker Company which later became Kraft Foods Limited, developed Vegemite which hit grocery shelves in 1923. But it wasn't until 1939 when it caught on with the public, gaining official product endorsement from the British Medical Association. Doctors even started to prescribe it for its vitamin B content. By 1942, Vegemite was so firmly fixed in Australian hearts and palates, it had to be rationed in order to meet the huge demand for it by the Armed Forces during World War II. Kraft released the "Happy Little Vegemite" jingle on the radio in 1952 that featured children singing about the positive health benefits of eating Vegemite for "breakfast, lunch, and tea." Two years later, the song made its way to television and continues to be featured in Vegemite's advertising to the present day. According to the Vegemite company, their product is rich in the B vitamins (thiamin B1, riboflavin B2, niacin B3, and folate). A 5 g serving delivers 25% of your Recommended Daily Intake of riboflavin and niacin and 50% of the RDI of folate. Vegemite contains no artificial colors or flavors and is certified halal and kosher. In a failed effort to increase sales, Vegemite briefly changed its name in 1928 to "Parwill." For 80 years, the original recipe for Vegemite has remained almost unchanged. In 1999, Vegemite became available in plastic tubes, similar to toothpaste tubes, making it easier to transport. Vegemite introduced a reduced-salt version in 2014. 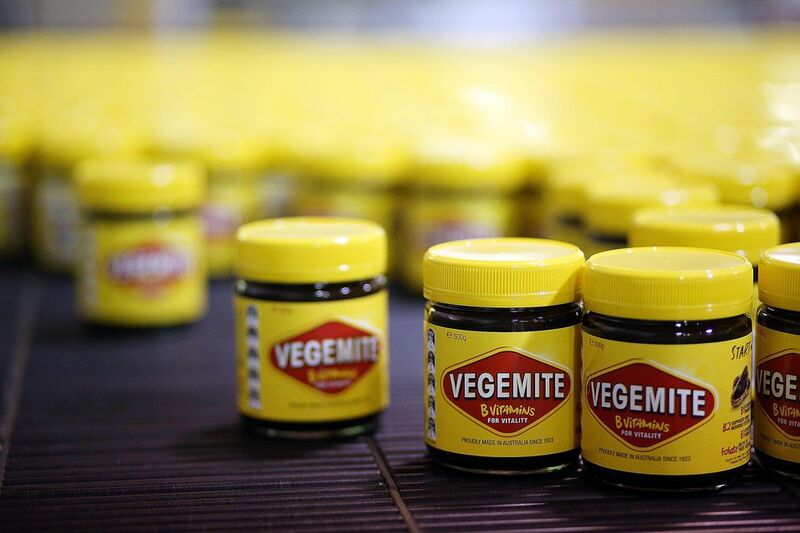 In 2008, Kraft Foods produced 22 million jars of Vegemite at its Port Melbourne manufacturing facility.